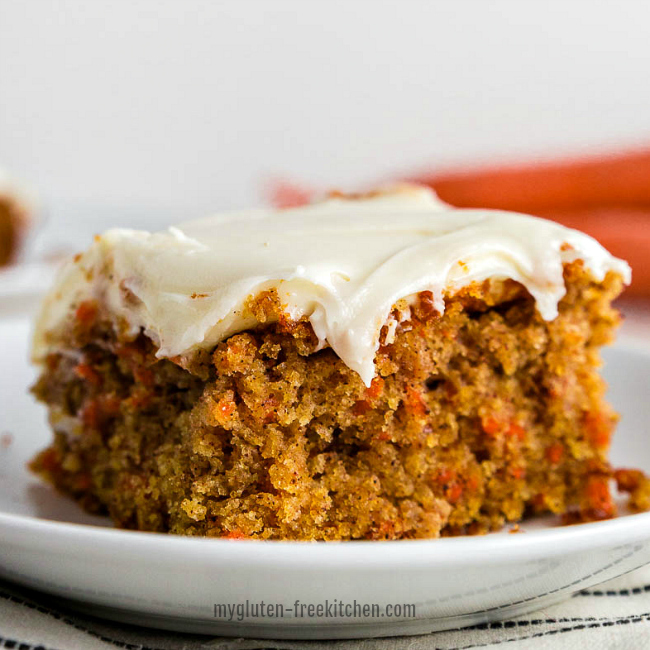 Does everyone else crave gluten-free carrot cake in the spring? 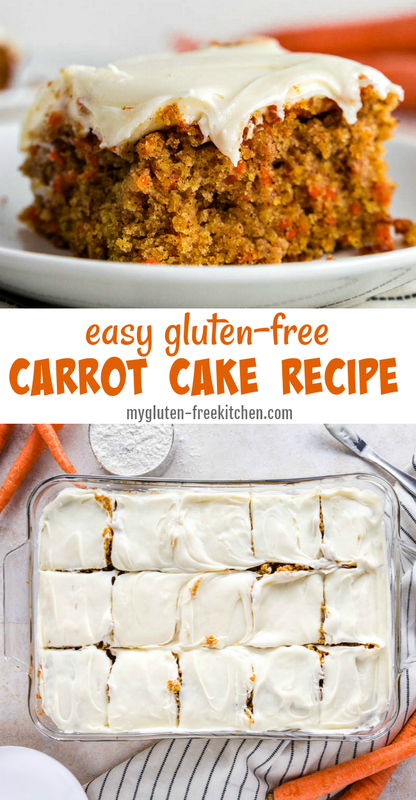 This easy gluten-free carrot sheet cake is one you’ve got to try! Just because you can’t have gluten, doesn’t mean you have to miss out on your favorite holiday and seasonal desserts! 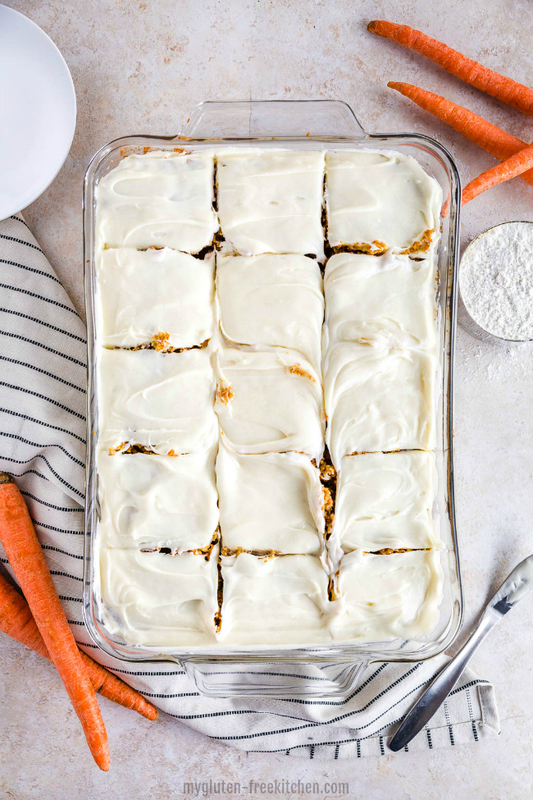 Has Spring had you craving carrot cake? 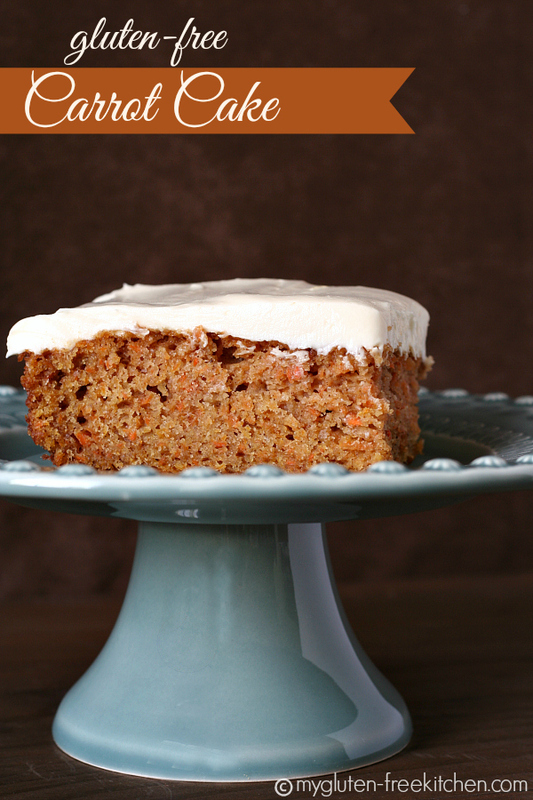 If so, you’ll love this gluten-free classic carrot cake. It got thumbs up all around from a dozen gluten-eaters this weekend! The best part is that it couldn’t be easier to make or serve, as it’s made as a sheet cake. No layers to mess with here! I surveyed many friends before making my gluten-free carrot cake to see what people’s preferences were on extra ingredients. There were only a few people that wanted nuts; most were adamant to not include nuts. Some liked raisins inside, some didn’t. Almost everyone said to definitely NOT include pineapple. Strong feelings on that one!! 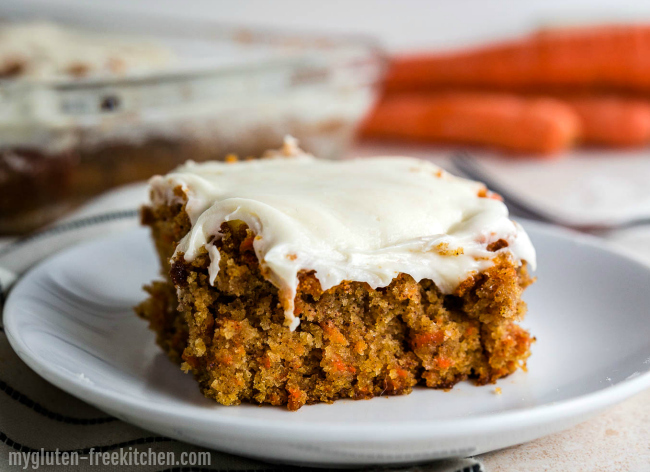 Ultimately, I decided to go for making a simple, classic, moist gluten-free carrot cake, full of spice flavor and topped with a tangy cream cheese frosting. If you like coconut, nuts, raisins, or pineapple, feel free to add in any of those! I’m not going to lie – I enjoy frosting as equally as I enjoy cake. You can’t have one without the other, in my opinion! 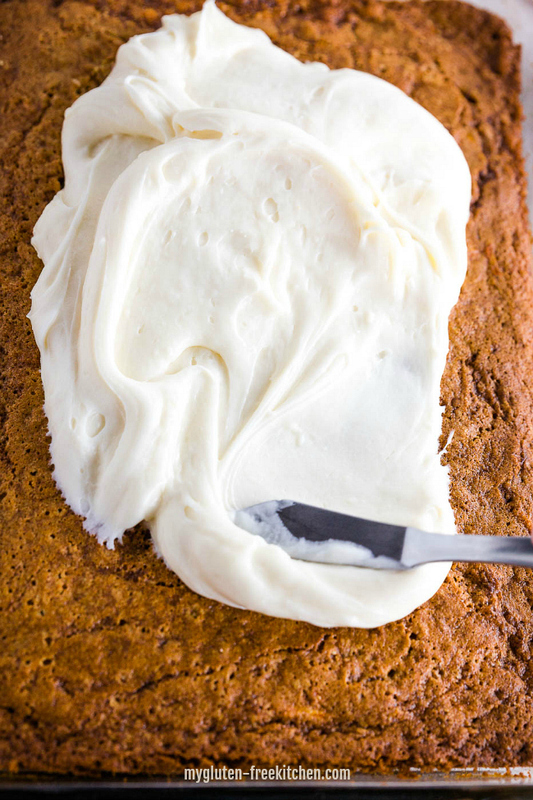 This cream cheese frosting has the perfect mix of sweet and tangy. 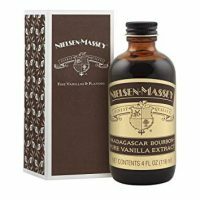 It’s made with cream cheese, butter, powdered sugar, heavy cream, and pure vanilla extract. Only the best ingredients and it makes a frosting so good, you’ll be licking your spreading spatula! Can this gluten-free carrot cake be made dairy-free? Yes! The cake is already almost completely free of dairy – the melted butter already includes a substitution to just add additional oil. The frosting recipe can be made dairy-free too. Use dairy-free cream cheese (I recommend Kite Hill), a butter alternative like Earth Balance or Melt Buttery Sticks, and your favorite dairy-free milk alternative for the cream. Or if you have it on hand, use a dairy-free creamer. Gluten-free Flour Blend: I have tested this with, and recommend, gfJules gluten-free flour or Gluten Free Mama’s All-purpose Almond Flour Blend. My friend Megan tested this cake with Bob’s Red Mill 1 to 1 baking flour and said it worked great. Other high quality gluten-free flour blends should work well in this too! Try your favorite! Xanthan gum: Omit this if your flour blend contains guar gum or xanthan gum already. Applesauce: applesauce is used here to cut the amount of oil needed, increase the flavor, and keep the cake moist. If you only have sweetened applesauce, you can use that and cut the sugar in the recipe a bit. Or you can replace the applesauce with additional oil. Unsalted butter: You can use salted butter, and then just adjust the salt in the recipe to only 1/4 tsp instead of 1/2. To make this cake dairy-free, then use oil instead of butter. Why did I call this cake easy? The hardest part is getting the carrots washed, peeled, and shredded. The rest is simple mixing together! Wash and peel your carrots before finely shredding them. 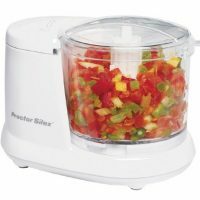 A food processor or food chopper is best for finely shredding them. You can save time by buying baby carrots too! Then you can just drop them right into the food chopper. The food chopper I use is this one that does about a cup of them at a time. I prefer it over my huge food processor as this one is so easy to clean – just plop the three parts right in the dishwasher! Looking for more gluten-free recipes with carrots? These carrot fritters caught my eye, as they’re unlike anything I’ve had before! These roasted rainbow carrots from my friend Megan will brighten up any dinner! I think serving them alongside any hearty meat dish would be a hit. Love soup? I added chopped carrots to my gluten-free cheeseburger soup. My friend Erin adds big carrot chunks to her Italian minestrone soup. And I add them to my hearty gluten-free ham cheddar chowder recipe too! So many options for carrots – just thought I’d share a few! Now go make this cake and serve up a big slice for yourself!! Recipe adapted from my fellow food bloggers Mel and Sally: unbelievable carrot cake (cake) and super moist carrot cake (icing). 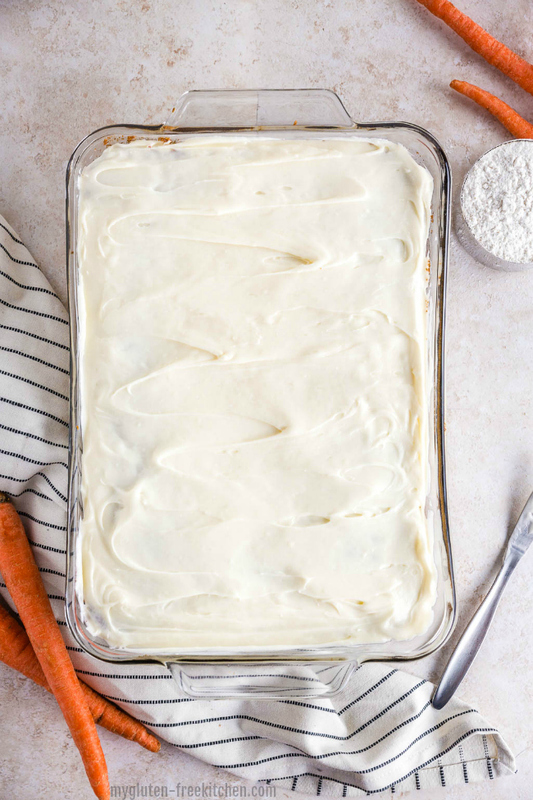 Follow this recipe to make a flavorful, classic, moist gluten-free carrot cake topped with a tangy cream cheese frosting. Perfect gluten-free Easter dessert! 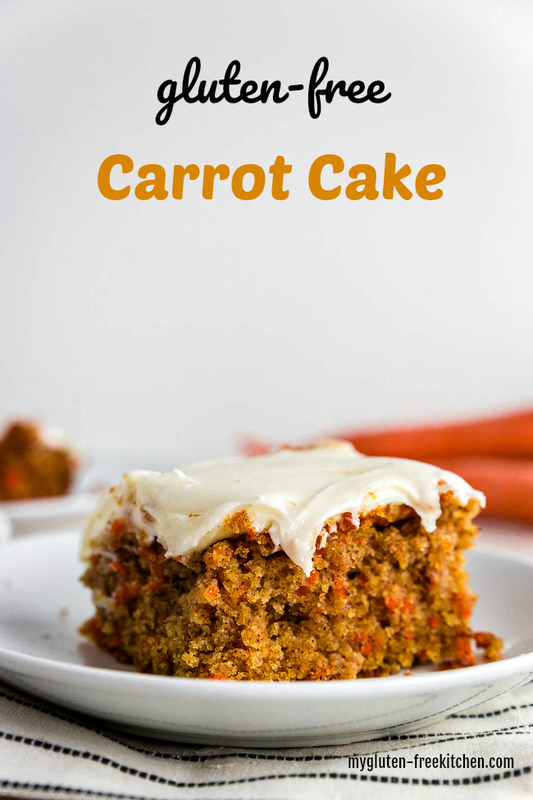 Feel free to add your favorite mix-ins like raisins, coconut or nuts, to this classic moist gluten-free carrot cake. Preheat oven to 350°. Spray 9x13 pan with cooking spray. I used a glass Pyrex pan. In a medium bowl, whisk together flour, xanthan gum, baking powder, baking soda, cinnamon, nutmeg, cloves, allspice, and salt. Set aside. In the bowl of your standing mixer, beat sugar, brown sugar and eggs on medium-high speed until thoroughly combined, about 45 seconds. Reduce speed to low, and slowly add the applesauce, oil, and melted butter. Mix on high for one minute, or until mixture is well mixed and light in color. Turn off mixer and stir in by hand the carrots and dry ingredients until no loose flour remains. Let cake cool, in pan, on a wire rack. In a mixing bowl, use a hand mixer to beat the softened cream cheese and butter for 3 minutes, or until soft, creamy and combined thoroughly. Add 2 cups of powdered sugar and beat until well mixed. Add the heavy cream or half and half, and pure vanilla extract. Beat on medium speed for 2 minutes. Add an additional 1/2 to 1 cup of powdered sugar until frosting reaches desired thickness and taste. Use a spatula or icing knife to spread frosting evenly over cooled cake. Slice into 15 large slices, or you can cut smaller slices if you prefer. Post updated with new text and photos April 2019. Originally published April 2014. Michelle, your cake looks truly wonderful! And the timing is perfect as I’ve been working on a Carrot Cake roundup for All Gluten-Free Desserts and am behind schedule. Now I can add your recipe link as well! Sometimes being behind schedule works out beautifully. 😉 Btw, it’s interesting to read folks’ preferences. I’m one who says no raisins, no pineapple, but absolutely yes on nuts. Hehe. Thanks Shirley! I did find it so interesting to see everyone’s preferences. I surveyed our small home group from church, as well as my Facebook friends, and it was sure all over the place in preferences. What was funny to me was how passionate everyone was about those preferences too! 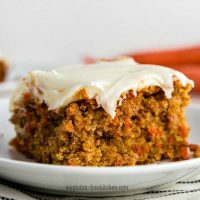 I’m so glad I’ll get to be included in your Carrot Cake roundup! Fun! My readers will love that! I haven’t tried any sugar substitutes in this recipe. The one I would feel comfortable recommending the most is coconut sugar. 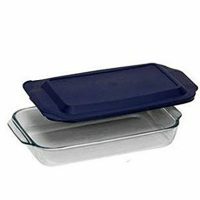 I’ve used it a few times in other recipes with great results. Hope that helps! Feel free to try any sugar substitutions that have worked well for you in other cake recipes. Made this today for Easter dinner…was yummy. My dad loved it, and he doesn’t normally try gluten free desserts. He didn’t even know the difference. The only change I will try next time is to swap out the oil with more applesauce, and cut back on the sugar, maybe even substitute with honey. I put pineapple in and it was great, next time will add raisins, coconut and walnuts too! Thanks! I’m so glad that your Dad loved it too! Great ideas for substitutions for next time! I love when people can just take my recipe and customize to their liking! Enjoy! Absolutely delish! Made it for Easter dinner and it was a huge hit! So moist and yummy. Honestly better than my old carrot cake recipe that wasn’t GF. I made this for Easter and it was soooo good! The whole family ate it and couldn’t even tell it was GF. Thanks for the recipe. So glad that your family all enjoyed this for Easter! Yay for you for making it for everyone! Let me know what you recipe you try next! I definitely recommend the Texas sheet cake on here! How long should you bake if you use batter for muffins instead of cake? Also how much pineapple and / or apples can you add to this recipe? Gail, If you do these as cupcakes/muffins, I’d start checking them for doneness at 18 minutes and then keep checking every minute or two until toothpick comes out with moist crumbs. I haven’t tried those additions but I think they would be great. The pineapple would definitely add some moisture, so I’d be careful not to use too much. Maybe 1 cup to start with? I have been asked to make a cake for a 25th wedd’. ann’. Think your gluton free carrot cake would fit the bill. I want to cook it on a sheet pan so am wondering is this recipe is large enough for 20 people. I have been asked to make a cake for a 25th wedd. Ann. Your gluten free carrot cake sounds wonderful. If I double the recipe and cook it on a sheet pan would it be big enough to feed 20 people? I would like to make this in 9″ round cake pans. Is it enough batter for 2 cake pans? Or maybe one thick cake? Thanks. Since this is a gluten-free recipe, how would you recommend to store this cake? Frosted or unfrosted? Freezer or is refrigerator okay? I need to make this the night before and I don’t want it to get dried out or the frosting to get all weird. Any suggestions are welcomed! Today is my first day cooking with the Mama’s Almond blend flour. totally excited. my first dish will be the Gluten-free Blueberry Muffin and second is the Gluten Free Carrot Cake. I’ll send pictures. My dietitian suggested that I use this flour. I’ve been suffering for years with immune disorders and pain in my feet. She helped me change my diet. I look forward to using more of your recipes. I hope the switch to gluten-free does help you and I really hope you enjoy these recipes! Happy Baking!